Now you can send online this Tempting Present of Eight Pieces Cadbury Dairy Milk Chocolates and spread warm love to others. 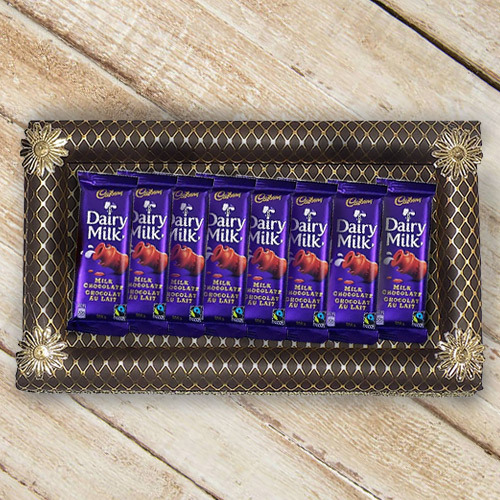 These Chocolates are exhibited in an embellished Tray. Flowers Delivery Vapi, Send sweets Panchkula, Wedding Cake Thrissur, Diwali Mithai Trivandrum, Send Flowers and Gifts to Gajraula, Online Shop Ankleshwar, Flower to Valsad, New Year Flowers Solapur , Fresh Fruits Chittoor, Send Gift Secundrabad, Dry Fruits to Vapi, Birthday Delivery Kolkata, Sending to Thiruvalla, Flower shop Tirupur, Tellicherri Online Cake Delivery.